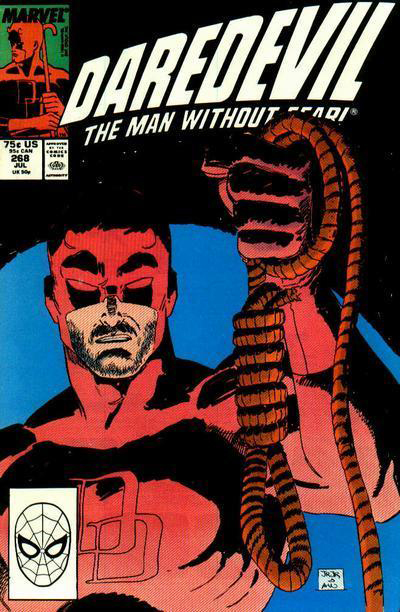 No one comic outside perhaps Brave And The Bold #194 got me more addicted to comics as a past time and artistic medium than Daredevil #268. 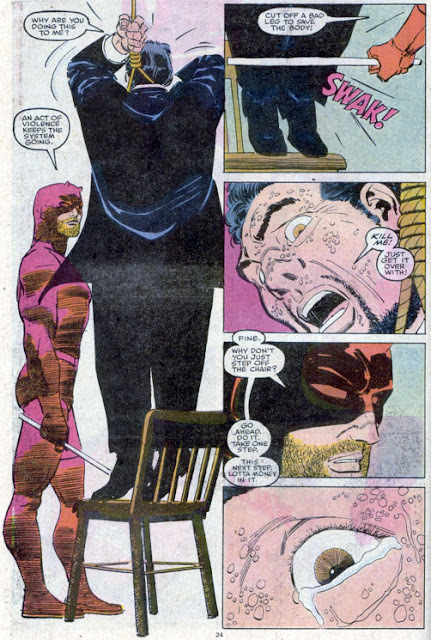 'Golden Rut' introduced me to three lifetime addictions in one foul swoop; Daredevil; the amazing art of John Romita Junior; and the storytelling of upcoming Green Arrow writer Ann Nocenti. In the small town I grew up in, every year the main street closed for a craft fair. Here the local independent bookshop would place on their stall, packaged bundles of six unsold comics for $5. I went through every bag before choosing my two, bending the top left corner of each to see the comic box art, revealing what reads were inside and which contained the most issues of The West Coast Avengers. An at the time unrecognisable Daredevil box didn't sway my decision, but unpacked at home as part of one of the chosen bags, it's cover injected me with two out of three said addictions right then and there. Inside it's done-in-one story (remember those? 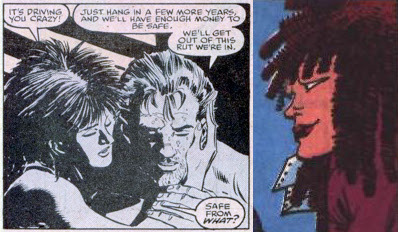 ), Nocenti never lets the team slip for a second. Taking a nod from shows like Stairway to Heaven, Quantum Leap and even The Incredible Hulk, Matt Murdock is wondering the highways of the U.S., helping out those in need and realising just how far into the nation's fabric the Kingpin's threads are sown. Raymo and Sally are a young in-love couple, who struggle through jobs each resent, to make enough to afford to get out of the golden rut they currently find themselves in. Sally, for her part opens their home to strangers as a highway bed and breakfast (and thus providing a nights lodgings to our hero), while Raymo, desperate to be the 'provider', works as a collector for his brother Hank in the 'family business'. A loan shark who believes in the trappings of power, Hank tries to manipulate Raymo into using stronger means of intimidation in order to become "of real value". There are just two catches; one Raymo is a pacifist at heart and still harbours guilt over the way his childhood dog Queenie looked at him after 'he let them' amputate her leg; and two after eavesdropping on the couples private discussion, Daredevil is now outside the shark's window, and returns that night to turn the bully into the bullied. And that's just one page of the interrogation! Colourist Max Scheele has to be given props here. The way he uses bold pinks to covey the intensity of Raymo's nightmares, then works the colours into the 'real world' to tie the story together is fantastic. Whether or not Raymo becomes more involved in his family trade, or if Hank steps off the chair for that matter, isn't for me to reveal here, but it does make me want to point out the issue's thought-provoking roles aren't left solely for the males. 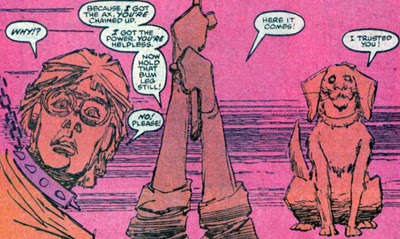 With no super-powered slugfests, cliffhanging multi-issue chapters or guest stars of the 'X' or 'Bat' variety, great comic stories can still be told. This little "Golden Rut" stands as proof of exactly that. Hey I loved JR JR DD too! You know what Marcelo, I'm thinking our tastes in 80's comics weren't that different! This just helps prove it!